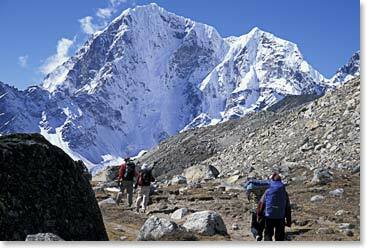 The trek to Everest Base Camp remains, in our opinion, the greatest mountain walk on earth. We will have the opportunity to view the most spectacular mountain scenery in the world. Besides Everest we will become familiar with other Himalayan giants: Ama Dablam, Cho Oyu, Lobuche Peak, Nuptse, Lhotse, and Pumori. Stayed tuned on our daily dispatches as our team visits ancient monasteries, explores the unique culture of the Himalayan people and trek on one of the most fascinating expeditions around. October 10, 2008 – The Team is on Their Way to EBC!